Japanese Episode DP 160: "Get Fired Up, Kabigon! The King of the Pokethlon!!" American Episode 1303: "A Marathon Rivalry!" On the way to Asatsuki Town, Satoshi and his friends come across a Kabigon. Before long, its trainer, Yuuta, appears before our heroes and explains that he's using scientifically proven methods to train his pokemon. He seems convinced that his methods are the best way to train, but Satoshi disagrees. He challenges Yuuta to a battle to see who has the better bond with their pokemon, but his invitation is declined. Instead, Yuuta suggests they settle their argument in a competition known as the Pokethlon. The Pokethlon is an event where pokemon face each other in three randomly selected competitions, with the next contest scheduled to take place in nearby Tsubaki Town. Always eager for a new challenge, Satoshi agrees to enter as a contestant. Before the first event, the two trainers leave their pokemon at a massage parlor to help them relax before their their debut. However, the parlor ends up being another one of the Rocket-Dan's traps and the trio makes their getaway with Satoshi's Pikachu. Yuuta's Kabigon eventually retrieves Pikachu, enabling both Satoshi and Yuuta to continue competing. The third event, the Dash Hurdle, begins with both Pikachu and Kabigon taking the lead. A photo finish reveals that Kabigon crosses the finish line just before Pikachu does, earning Yuuta the grand prize. Despite his win, Yuuta tells Satoshi that he sees his point about not relying solely on science to raise his pokemon. Now that he's tried out the Pokethlon, Satoshi rejoins his friends on their journey to Asatsuki Town. The Pokethlon is a weird beast. 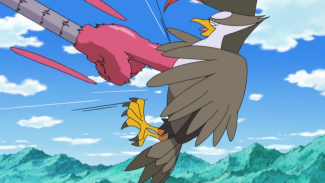 The show neglected to bring it up at all when Kotone was with the group, instead waiting about four months after the release of HeartGold and SoulSilver to even acknowledge its existence. And the producers of the show obviously didn't want to make this optional little side quest from a couple of money grabs remakes (a side quest that we, by the way, have no reason to believe will be featured in any future installments) into a full-blown quest. So, we're given a light introductory episode instead. It reminds me a lot of that one Side Story episode where Hiroshi goes to one of the Seven Islands from FireRed and LeafGreen. Could they have done more with the remake-only content? Sure. Is the fact that they didn't worth moaning about? Of course not. Once you take your mind out of "OMG teh sh0W R@peD teh POkeaThaL0n!!1!1!" mode for a moment, you'll uncover a fairly decent episode. I think part of the challenge in making this episode was figuring out what the hell to do with all the pokemon's trainers during each event. We can't very well just have them sit there and watch their pokemon do all the work, so what can you do? I think they found decent solutions, especially where the Dash Hurdle is concerned. 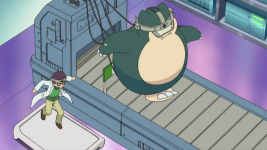 Other things that amused me include the return of the Rocket-Dan's tickle robot from way back when, Yuuta's ridiculously stereotypical fashion sense (this lab coat won't get in the way during this athletic competition at all! ), the faux Wii Balance Board Yuuta's jumping on in his strangely shaped lab, this gay couple, and the unimpressive crown Yuuta wins as a prize. This episode certainly has the usual amount of baffling moments (Why did Yuuta have his Pokethlon poster hidden behind a curtain? Why did they build this huge stadium for a competition that only consisted of three short events? Why doesn't Yuuta compete with any Generation II pokemon?) but for me, the good outweighs the bad. I can't really stand Daniel's voice in the dub, but we'll never see him again, so whatever. Brock: "Of course! This must be the first Pokéathlon ever to be held in Sinnoh, right?" Daniel: "You mean you've heard of the Pokéathlon before?" Ash: "Sure. See, we spent lots of time traveling through Johto." These lines aren't really any different from the lines said in the Japanese version. 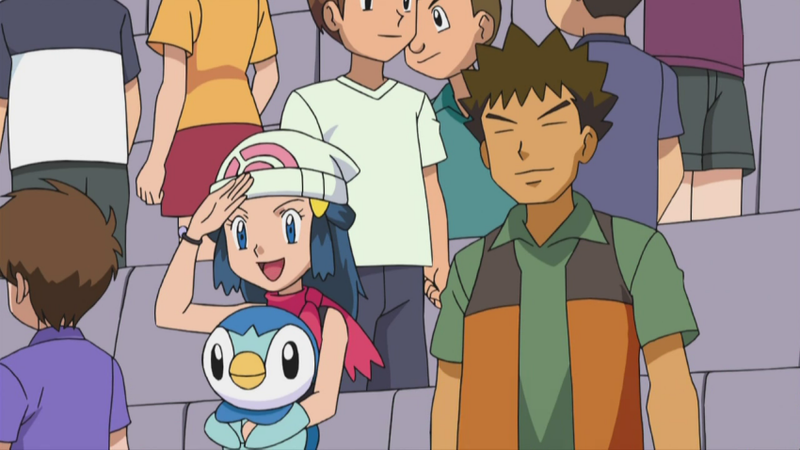 I've noticed a lot of people complaining that Ash and Brock have never competed in the Pokéathlon before and that it's ridiculous for them to claim that they have. The thing is, that's not what's going on here. Satoshi and Takeshi are simply saying that they've heard of the Pokéathlon before, not that they've actually competed in it. Of course, we've never seen them come across this information before, but is it really that much of a stretch to assume that they heard about it off-screen at some point? We can accept off-screen training and off-screen phone calls to old friends, so what's so far-fetched about some off-screen overhearing someone talk about this at a Pokemon Center? Or some off-screen walking by a poster? Yeah, it's a less-than-convincing attempt by the writers to try to pretend that Pokethlons have always existed, but it's not as continuity-shattering as others would have you believe. Dawn: "So the first event is a Disc Catch, followed by a half-time show instead of a normal second event, and then finishing up with a Hurdle Dash." Ash: "Wow, a Hurdle Dash? Man, that event sounds cool." Dawn: "The whole day sounds cool!" Originally, Hikari only covers the first two events, and Satoshi's line introduces the third event. For some reason, the dub has Dawn list all three instead. In addition, Hikari mentions the name of the second event - Bound Field (Lamp Jump in the English versions of the games) - but Dawn, for whatever reason, does not. Jessie: "When it comes to massage art, we're all thumbs!" Here, Musashi says "The heart of shiatsu is a pokemon's love" (指圧の心はポケ心). This is a variation of a quote from Namikoshi Tokujiro, the founder of shiatsu therapy, who stated that "the heart of shiatsu is a mother's love" (指圧の心は母心). The dub didn't pick up on this. The robotic voice that does the count down at the start of each event gets a new voice for the dub even though the one in the original is speaking in clear English. Boo. Announcer: "Ladies and gentlemen, replacing our second event, for your enjoyment, this very special performance exhibition. So give it up for last year's champion, Spo~ink!" Again, the dub refuses to say "Lamp Jump" for some reason. They also avoid directly mentioning the fact that Spoink was the winner in Johto, unlike the Japanese version. Brock: "Hold on! I don't see Ash down there." Dawn: "Ah~...but the Hurdle Dash is going to get started...now!" No, Dawn. You're watching the Lamp Jump now. The word you want is "soon," not "now." Musashi: ""Are wa ittai!?" no koe o kiki!" Kojirou: "Hikari no hayasa de nigete iku"
Musashi: "Sekai o hoguse yo massaaji!" Kojirou: "Shiatsu no haato wa poke-gokoro"
Musashi: "Okyuu ka hari ka hodokoseba"
Kojirou: "Karada mo hogureru miwaku no iyashi"
Musashi: "When we hear a voice saying "what in the world is that!?"" Kojirou: "We run away up at the speed of light." Musashi: "The word "massage" is protected by the world!" Kojirou: "The heart of shiatsu is a pokemon's love!" Musashi: "Whether you use moxa or needles,"
Kojirou: "Even your body relaxes at that captivating healing"
Kojirou repeats Musashi's misquote of Mr. Namikoshi's famous line at the beginning of the motto as a heart animation appears on the screen. Moxa is short for moxibustion, a healing technique that neither I nor my spellcheck had ever heard of before. It's apparently used in many Asian countries in conjunction with acupuncture to help stimulate blood flow. Jessie: "Out of this world, that's how we roll." James: "Being grounded can take its toll." James: "Dashing all hope, putting fear in its place." Jessie: "Magic fingers bring harmony and joy"
James: "But not to a certain twerpish boy." Jessie: "You do-gooders sure are uptight." Notice Meowth's not-so-subtle reference to the GS remakes in there? Other than that, it looks like TPCI didn't want to bother doing the research to make the various massage-related references made in the original, so they just rewrote the whole thing. I wish they had written something to fit the animation of the heart appearing over Kojirou, but I guess they assume that dub viewers are used to having a mismatch between the words the Rocket-Dan says and the accompanying animation. 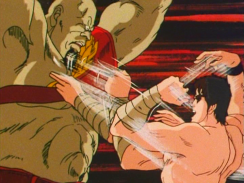 The attack that Nyasu uses against Mukuhawk is the "Magic Arm Hundred Crack Fist" (マジックアーム百裂拳), a parody of Kenshiro's signature attack ("North Star Hundred Crack Fist," 北斗百裂拳) in the classic series Fist of the North Star. Nyasu even imitates the noises Kenshiro makes whenever he launches the attack! The series has been uploaded onto Hulu, so those of you who live in the U.S. should check it out if you haven't already. Daniel: "Well, if I'm gonna beat you fair and square, I've gotta use science all the way down the line." Originally, Yuuta says that he wouldn't be able to prove that scientific training is superior if he didn't win fair and square.